The soil moisture is the amount of water stored in the interstices or cracks of a substrate. It is a fundamental variable in the agricultural sector, for example, since this water serves as a solvent for the transport of the nutrients that the plants need to grow. But it also important to learn how to measure soil moisture to regulate the temperature of the soil, favoring, in the same way, the development of beneficial microorganisms for crops, such as those in charge of fixing nitrogen. However, to determine if its quantity is the best and to decide if an extra contribution is necessary through irrigation, it is advisable to rely on precise monitoring systems. The information that transmits the sense of touch to contact with the earth is an accepted and proven method but requires experience to obtain valid results (Martin, 2017). How can soil moisture be measured? Direct, which includes elements that are based on a sample of soil before and after passing through a drying oven. Indirect, which consist of the estimation of soil moisture by calibration with some other measurable variable. Which method is better? The techniques included in the group of direct methods, for example, offer great accuracy and are affordable, but they involved the destruction of the soil and its execution takes a long time, which in practice makes its use in the field unviable. Therefore, in agricultural activities, maintenance of golf courses, gardens, leisure areas, etc., indirect methods are usually employed. 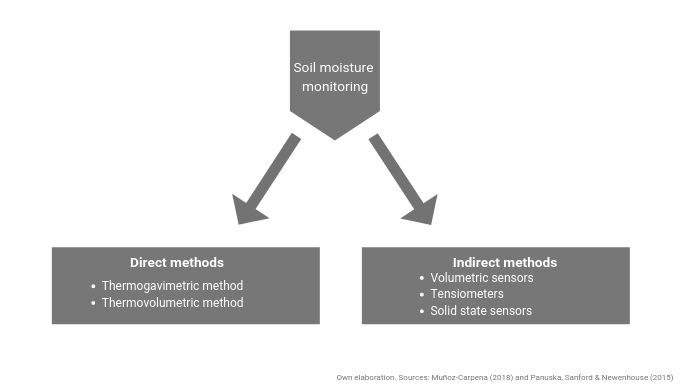 Which indirect method is more convenient to know the soil moisture? Volumetric sensors, which measure the amount of water existing at the depth where they are placed. The most common system is the monitoring of the constant dielectric, which is the capacity of the soil to transmit electricity. This increases as the water content gets bigger. Although these sensors are pre-calibrated for their use in a wide range of soil types, it is recommended to do an on-site calibration on coarse-textured soils (sand) and soils with high salt contents. They stand out for their accuracy, altering the floor in a minimal way. 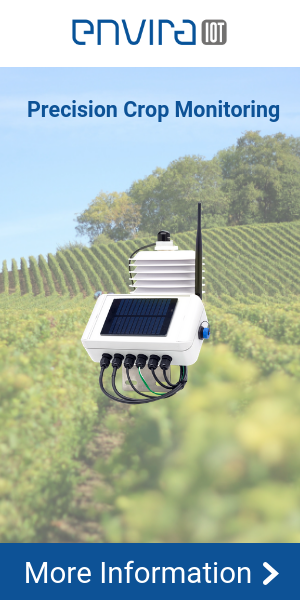 ENVIRA IoT develops monitoring devices that include volumetric sensors to monitor soil moisture in agricultural projects. The objective is to achieve crop welfare with the measurement of environmental variables. Tensiometers, which measure the intensity of the force with which the soil retains water or the amount of water that the plant has at its disposal with minimal effort. This system is based on the burial of the device up to the root zone of the plants, a process in which it is necessary to avoid creating a hole with a larger diameter than the tensiometer in order to prevent that free space from providing false readings. Therefore, and depending on the soil conditions, sometimes it will be enough to push the device until the desired depth and, in other cases, it will be necessary to drill a hole before. 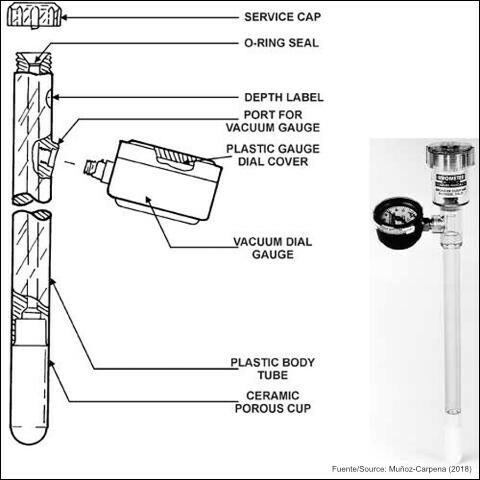 Solid state sensors, also known as gypsum blocks, which consist of two electrodes embedded in a block of porous material, usually gypsum, and connected to a cable that transmits the information to a portable meter. Although they are simple and affordable, their reaction time is slow and the readings they offer change over time as the gypsum block dissolves. Soil texture. If the texture is fine, the water is retained in a very strong way, making difficult the monitoring through tensiometers. The frequency of monitoring desired since the response times between the different devices vary. Physical properties of the soil, variable that determines the use of equipment that requires good contact between the soil and the instrument. Maintenance of the devices, appearance influenced by the type of soil and hydrological conditions. Why is it recommended to measure soil moisture? The European Citizen Initiative (ICE) People4Soil, in which more than 400 associations, environmental groups or research centers participate, makes it clear: the efficient use of water, the reduced use of pesticides and the improvement of soil health can lead to an average increase in crop yield of 79%. Through the monitoring of soil moisture, it is possible to achieve a responsible use of water. Knowing if a land or crop needs an extra supply of water makes irrigation much more efficient, avoiding useless consumption of this scarce natural resource. But as already noted briefly in the introduction, the soil moisture also contributes to the growth and development of the microorganisms involved in the transformation of the plant, its diversity and the activity of soil enzymes. Thus, it has been shown that both very dry and very moist soils create unfavorable conditions that lead to a decrease in the biomass of microorganisms (Borowik & Wyszkowska, 2016). Ultimately, and as the Cosmos-UK website says, «measuring soil moisture and developing the knowledge of how varies according to the place and time is fundamental to better understand future conditions» that will impose phenomena such as climate change. Panuska, J., Sanford, S., and Newenhouse, A. (2015). Methods to control soil moisture. Department of Biological Systems Engineering, Faculty of Agricultural and Life Sciences, University of Wisconsin-Madison and University of Wisconsin – Extension, Cooperative Extension. Muñoz-Carpena, R. (2018. Year of publication of the original article 2004). BUL343 / AE266: Field devices to monitor the water content of the soil. University of Florida, IFAS extension. Martin, E. (2017). Methods to measure soil moisture for irrigation scheduling When? University of Arizona College of Agriculture and Life Sciences. Borowik, A., and Wyszkowska, J. (2016). Soil moisture as a factor that affects the microbiological and biochemical activity of the soil. Plant, soil and environment, 62 (No. 6), 250-255.